Relief Shelter Drive is a purely grassroots initiative undertaken by a group of individuals in the US, UK and Pakistan. These young professionals and graduate students are committed to using their networks to channel monetary and in-kind donations of shelter in a timely fashion through carefully selected channels. Click here for the latest developments! In the United States, tax-exempt donations can be made towards Relief Shelter Drive through the registered 501(c)(3) organization Association for the Development of Pakistan (ADP). Donations outside of the U.S. can be made directly to the registered organization Education for Human Development (see payment options for more details). 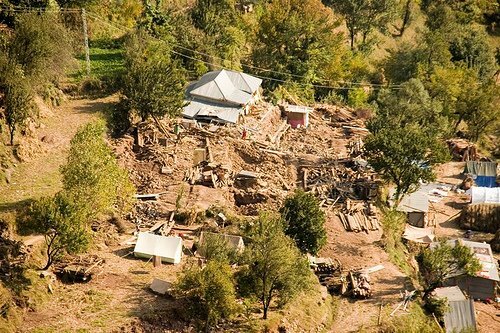 A bird's eye view of what remains of the village of Surul, one of the areas RSD is providing shelter to. More pictures of Surul Valley available here. To ensure shelter is provided to deserving people who have not yet received any form of shelter. To provide a transparent system of distribution of shelter and to provide you online tracking of where and how your contributions are being used. To research creative shelter solutions on the basis of cost-effectiveness, availability of material, ease of assembly, durability, and while ensuring that they are waterproof and shock-proof structures. View pictures from the field of our volunteers, Imran Saithna and his team, setting up the Bori-shelter homes in the Surul Valley.